Hello. I'm Sara Thomas, Owner of Mathnasium of Edmonton SE, your neighbourhood math-only learning centre. We help kids in grades 2-12 understand math by teaching the way that makes sense to them. We officially opened November 2018. 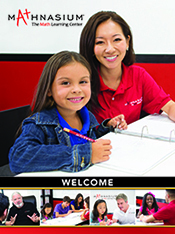 We specialize in getting your child caught up in their math skills, so that they can keep up in class and get ahead. Located off of Whitemud Drive, take 17 Street exit. We're in RioCan Meadows, beside MARKS, near a Superstore, Winners, Home Depot, Staples and three banks! Contact us at (780) 466-MATH to see how we can help your child. First of all I appreciate all Mathnasium teachers and staff .My kids are feeling so confident with Mathnasium teachers. They are providing nice education . My both kids are very happy with them.and geting good scores. Finally we all happy because my kids are in safe hands .. I like that my son not only receives extra practice in math, but that he can bring in his homework and ask questions on what he is currently working on in school as well.